It was nice that Thursday was an off day, and I used it to do as little as possible. I had a physical therapy appointment at 2:00 pm and didn’t do much else besides that. My knee hasn’t gotten any better, and it’s actually worse than it was five days ago. I think the fast walking on Wednesday didn’t do me any favors. I left Madison at 3:30 on Friday, and made it to the Braves 2 parking lot by 5:00. I walked (slowly) back to the general lot to spread the word. It went well and my message was well received, except for one group. 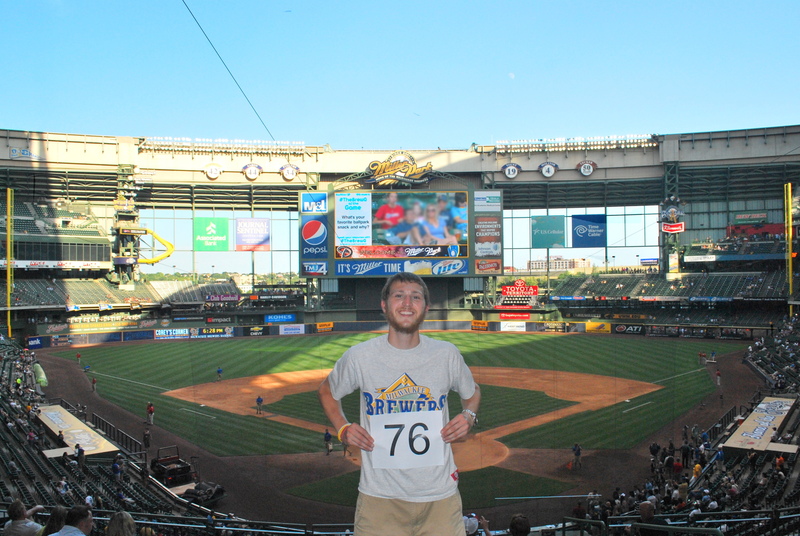 My routine is to ask people if they’ve heard about the guy going to all 162 Brewers games, and then go from there. They hadn’t and I told them that I was doing such a thing and I was raising awareness for Be The Match. This is when I usually start handing out my business cards and giving my spiel. One of the guys I tried handing a card to just refused, and said “nope, this is my last game of the year.” I don’t think he understood what I was talking about, so I tried to get his attention (and maybe make him feel a little guilty for being so harsh). I said “well I’m a Leukemia survivor, I got a bone marrow transplant and I’m raising awareness for the…” He basically just stopped me there and said “no”, and refused the card. I think I just said “wow”, turned my back, and walked away shaking my head. Everyone else I talked to seemed interested, or at least listened to what I had to say. A group of four guys offered me a brat and a Sun Drop, and I graciously accepted. I stayed and chatted with them for a bit but I didn’t get their names. If you guys are reading this; thank you! 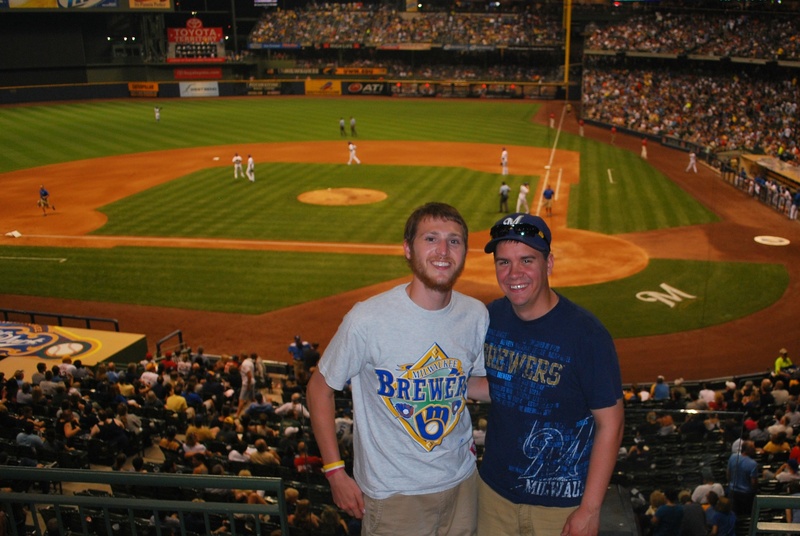 I headed inside after about an hour in the parking lot, and was in Miller Park by 6:15. I went to section 219 for my game number photo. After taking a couple practice shots to see where I wanted to stand I spotted my twitter follower (Scott) who was joining me for the game. I had tweeted the day before that my extra ticket was available and Scott said he would join me. He donated $40 to Be The Match, which is $10 more than I requested. Thanks Scott! I walked over to his seat in 221 and had him take game photo number 76 for me. I asked him to get both foul poles in the shot and he got the job done. Nice work! After getting the picture taken we sat in our seats and talked baseball until the game started at 7:10. Randy Wolf was on the mound for the Brewers, and he’s been struggling this year. He gave up a one-out double in the first, but got out of the inning unscathed. In the bottom half of the first the Brewers got back-to-back singles from Aoki and Morgan. Braun flew out to right, Aoki advanced to third and then Ramirez grounded out weakly to third. It was hit slow enough to prevent the D-Backs from turning a double play, and it allowed Aoki to score. 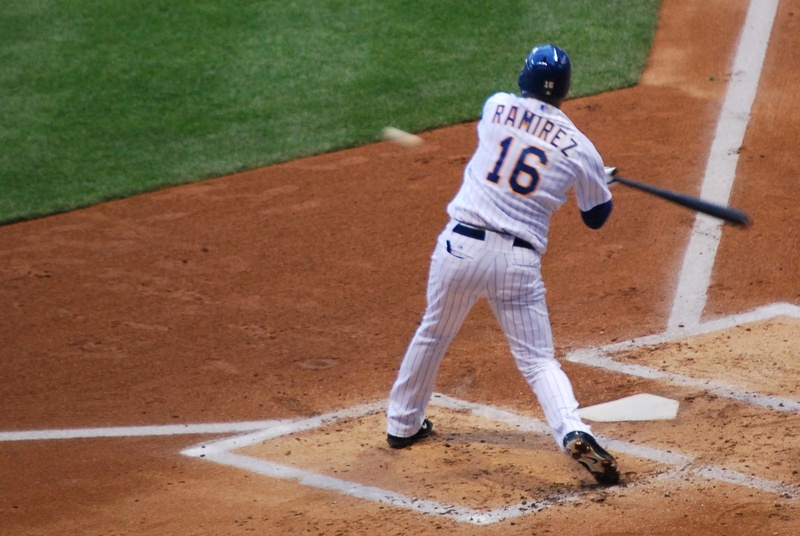 As you can see, Ramirez didn’t get much behind the swing, but it got the job done. The Diamondbacks tied it in the second and then erupted for five runs in the third inning to take a commanding 6-1 lead. The last three runs of the third came on a three-run home run off the bat of Paul Goldschmidt. He got some love at home plate from the guys he drove in. The D-Backs added two more in the fourth and another in the sixth. The run in the sixth was driven in by Aaron Hill, who tripled to right centerfield. Hill had already doubled in the first, singled in the third, and homered in the fourth. 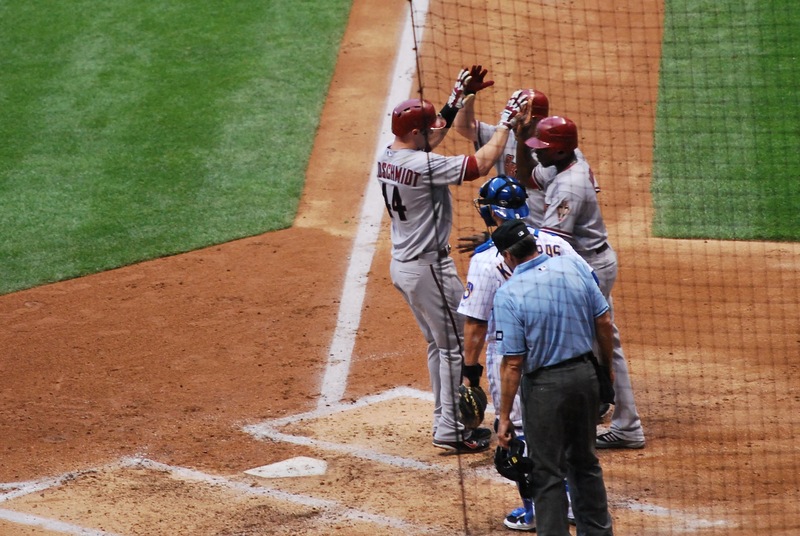 This meant that the triple completed a cycle, the SECOND cycle of the month for Aaron Hill! Unbelievable. I had never attended a game where a cycle had been achieved, so it was *kind of* cool to see. I’ve now been in attendance for a no hitter (Justin Verlander vs. the Brewers in June 2007), a 5-4-3 triple play (Aaron Rowand groundout vs. the Brewers in September 2009), and now a cycle. The ball was thrown back to the infield, and then thrown towards the Diamondbacks dugout as a keepsake. Instead of bouncing to one of the guys at the top step of the dugout it went over their heads and into the stands. You can see a bunch of D-Backs players and coaches pleading for the ball back, and Aaron Hill chilling at third base. Eventually the fan gave the ball back and someone threw a different (meaningless) ball back to the fan. 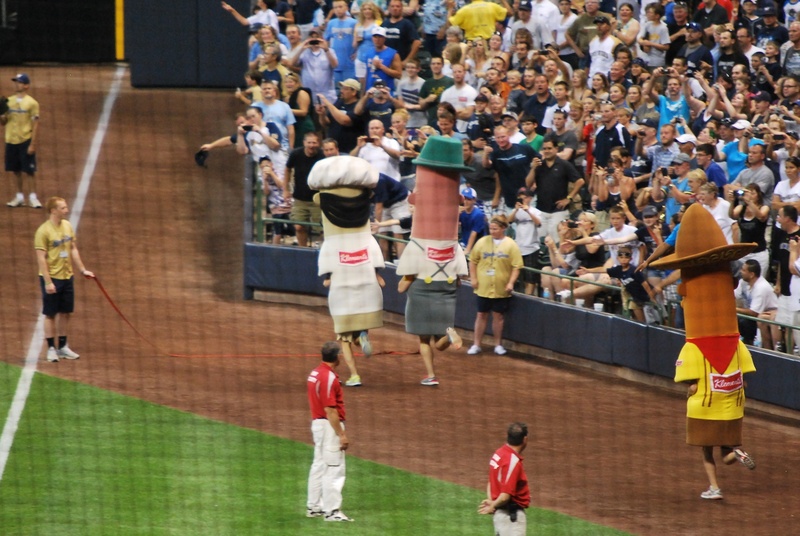 The sausage race takes place between the top and bottom of the sixth inning, and it was the most competitive thing all night. I decide who I’m picking by looking at the contestant’s legs. I couldn’t see the Bratwurst’s legs, so I chose the Italian even though I dislike the sausage for taste reasons. Once the race started and the Bratwurst’s legs were visible I could see she was wearing pink shoe laces. I’m guessing it’s the same girl who had pink laces before, and she won both times I’ve seen her. It was a photo finish (they dropped the tape early; BOOOO) and the Bratwurst got the win. In the bottom of the sixth the Brewers scored two runs, and with another single they could’ve cut the lead to four. Taylor Green flew out to centerfield with runners on second and third, and the Brewers’ two runs in the frame concluded the scoring. 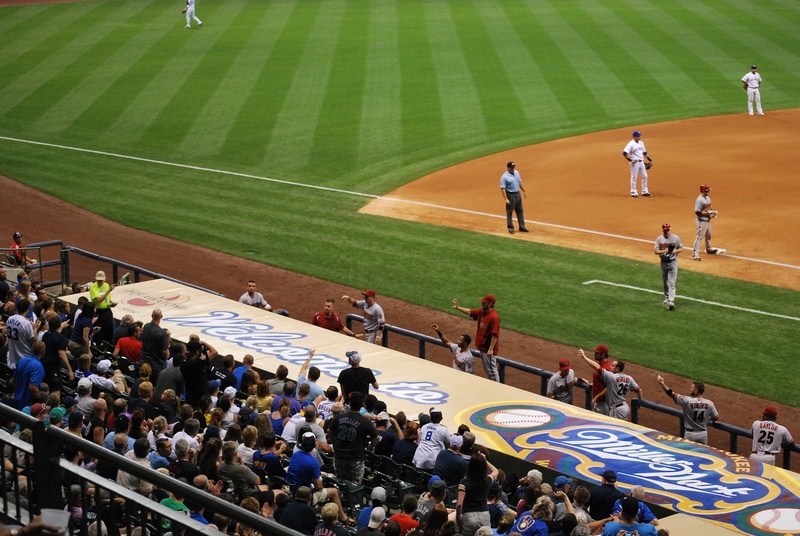 Final Score: Diamondbacks 9 – Brewers 3. After the sixth inning I had a fan a few rows in front of us take a picture of Scott and myself. I’m on the left, Scott’s on the right. 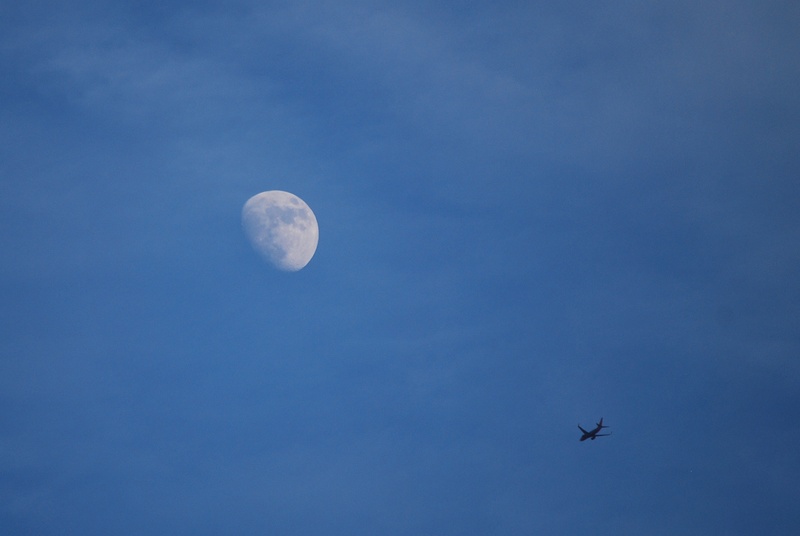 At one point I saw an airplane flying dangerously close to the waxing-gibbous moon and I thought it was picture-worthy. What was the pilot thinking!?!? That’s all for now, tomorrow (well, today now) is a new day. If the Crew can win the last 9 games before the break they’ll be a game over .500. Never say never!